This article was last edited in 2008. Some of its information may be outdated. 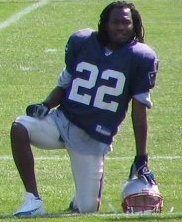 Asante Samuel is a National Football League cornerback for the Philadelphia Eagles. He was born on January 6, 1981 in Fort Lauderdale, Florida. Asante is 5' 10" (tall) and weighs 185 pounds. Asante attended the University of Central Florida and played at cornerback for the Central Florida (college football team) Golden Knights three of his four years there. In his freshmen year he played at strong safety. He was an impact player both on special teams and defensive back for the team throughout his playing time with the team. In his career with the Golden Knights Asante accumulated a total of 127 tackles, 38 pass deflections (a school record) and 8 interceptions. On the special teams unit he contributed a career total of 63 punt returns for 673 yards (10.8 avg) and 10 kickoff returns for 168 yards. He was named the teams special teams unit captain in his senior season. In 2003, the New England Patriots drafted Samuel in the fourth round of the 2003 NFL Draft. In his rookie season with the Patriots he played in all sixteen games mostly as a backup cornerback and made one start (week seven vs the Miami Dolphins). He made his first career NFL interception on the third week of the season in a game vs the New York Jets when he intercepted a tipped pass from Jets quarterback Vinny Testaverdeand returned it 55 yards for a Patriots touchdown. The points gained on the touchdown scored ended up being the difference in a 23-16 Patriots victory over the Jets and Samuel was named the Defensive Rookie of the Week... In the 2003 postseason, he made a big play in the divisional game vs the Tennessee Titans when he broke up a 4th down pass intended for Titans wide receiver Drew Bennett to seal a Patriots victory. The following season, 2004, Samuel essentially became the Patriots starter at cornerback as both of the original starters at the position (Ty Law & Tyrone Pool] went down with season ending injures. Samuel was not exempt from the injury bug that hit the Patriots secondary as he himself missed three games due to a shoulder injury suffered in a game vs the Saint Louis Rams on the first play of the game. He still managed to make an impact when he played however, starting ten games and playing in thirteen. In the Patriots week thirteen matchup with the Cincinnati Bengals he provided the winning points in a 35-28 victory when he intercepted Bengals quarterback Carson Palmer and returned the interception 34 yards for a touchdown. He started all three of the Patriots 2004 postseason games and in the AFC Championship game batted down an amazing 5 passes. In 2005, Samuel started all 15 games he appeared in and set then personal career highs for a season in almost every one of his statistical defensive category's. In the Patriots come from behind win on ESPN's Sunday Night Football he made a key diving interception that helped the Patriots win 21 to 16... In the 2005 post-season Samuel was the Patriots unofficial MVP as he made 2 interceptions, including one that he returned 73 yards for a touchdown, 6 knocked down passes, and 7 tackles in the Patriots two post-season games. In 2006, his production exploded as he set career highs for total tackles (64), interceptions (10 - tied for best in the NFL with Champ Baily), and passes defensed (14). In the 2006 season he started 15 games (he missed one due to injury) and three multiple interceptions games. He had the best game of his career on the week eleven matchup with the NFC best Chicago Bears when he had 3 interceptions, 9 solo tackles and 3 passes batted down. The last interception he recorded in the game sealed a 17-13 Patriots victory over the Bears. He was named AFC Defensive player of the week for his effort. As always, Samuel saved his best playing time for the playoffs and in the 2006 Patriots playoff run Samuel (three playoff games) had 2 interceptions, both returned for touchdowns (tying an NFL record  for most interceptions returned for touchdowns in the playoffs), 7 tackles, and 7 passes defensed. After the 2006 season, Asante's contract with the Patriots ran out but the Patriots decided to place their franchise tag on him. The franchise tag effectively makes the only team he can do contract negations with the Patriots who must at pay him at the minimal a NFL set predetermined price. Soon after applying the tag, contract negations between Samuel and the Patriots appeared  to be going well but they soured  as they reached difficulty's  in reaching a common price on his value. After almost a month of holding out of the Patriots Training Camp, Samuel signed the one year franchise contract. This page was last modified on 26 July 2018, at 02:34.